Your custom pre-rolled cone order starts with a free digital mockup - you will receive a photo like the one to the right. This is an opportunity for you to see what your custom cone would look like and adjust your design. Our custom cones allow you to showcase your brand on the "crutch" of the cone, so make sure you come up with the best design, choose the right paper type, and right colors. The refined flax paper (white) is the most see-through for custom branding. The unrefined flax (brown) is the best natural colored paper type, since the hemp paper (tan) is the most opaque. We can also do custom branded external wrappings, which is a custom printed sticker that is wrapped perfectly around the filter tip. If you would like physical samples of your custom branded pre-rolled cones, you can order 100 pre-rolled cone samples of your custom design. Please Note - the 100 pre rolled cone samples are just intended as samples. 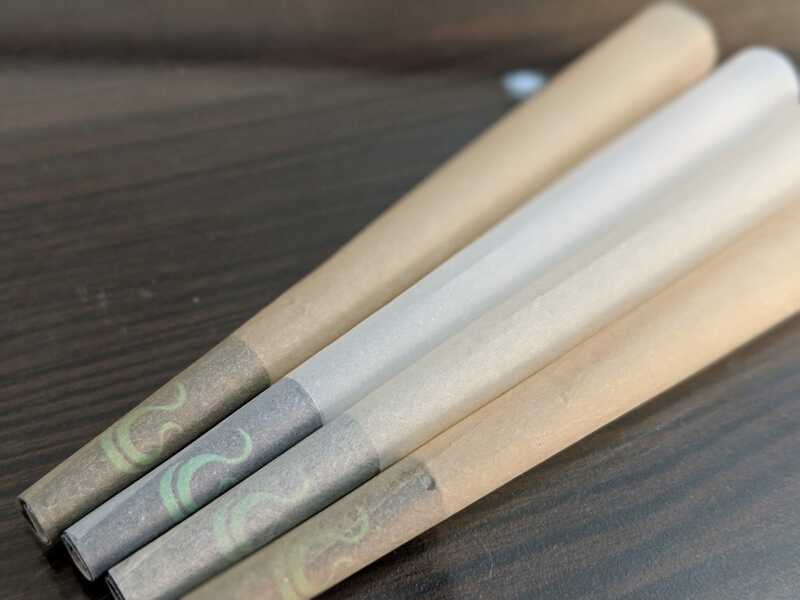 The custom branding on physical samples is printed with a digital printer, which is not as good quality as the offset printing used on your final custom branded pre-rolled cones. Physical samples are perfect for seeing the general size, positioning, design, and color of your custom pre roll project.